At the Military Medical Academy for the first time, the replacement of aortic valve without a surgical incision was done in two patients 82 and 77 years of age who are successfully recovering. 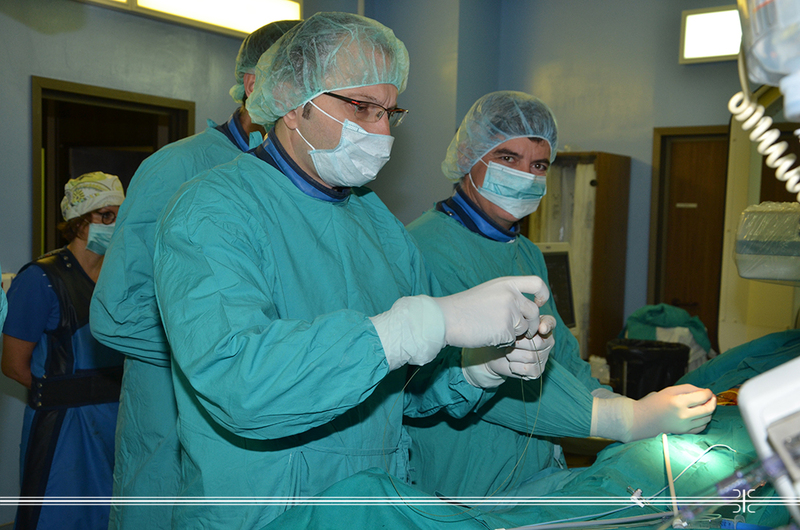 The procedure was carried out by the Military Medical Academy's cardiac surgery team consisting of doctors from the Clinics for Emergency Internal Medicine, Cardiology, Cardiac Surgery, Vascular and Endovascular surgery, Anesthesiology and Institute of Radiology with the assistance of Prof. Dr. Matjaz Bunac from the Clinical Center Ljubljana. The method of percutaneous - non-surgical replacement of aortic valve, preceded by a detailed clinical examination of the patient's health status has been introduced into a regular clinical practice in developed countries, and over the past years, more percutaneous than open-ended surgeries have been performed in the world. This interventional transcatheter aortic valve insertion (TAVI) is performed by entering through the femoral artery (the large artery in the groin) significantly reducing the duration of intervention on the heart. It is primarily indicated in patients over 65 years of age with severe aortic stenosis (narrowing of the aortic valve) and in case of an increased risk of operative treatment by a classical procedure with the opening of the chest.